Baba Deep Singh (1682–1757) is revered among Sikhs as one of the most hallowed martyrs in Sikhism and as a highly religious person. 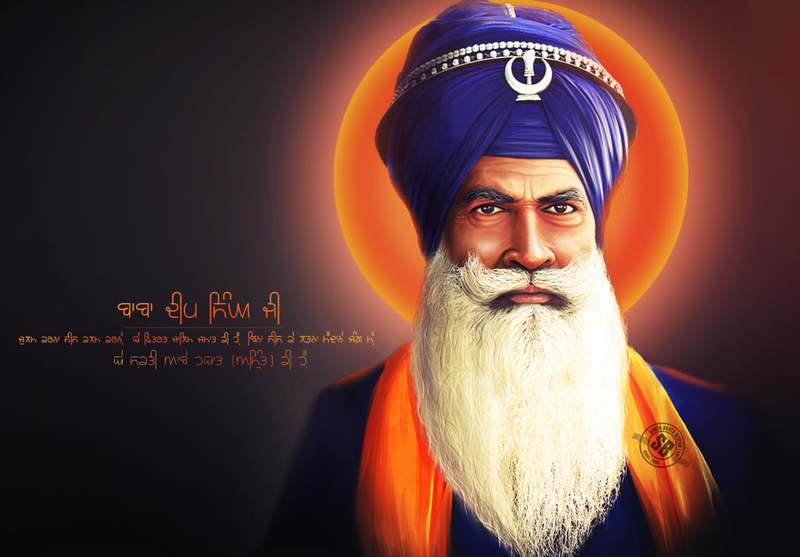 He is remembered for his sacrifice and devotion to the teachings of the Sikh Gurus. Baba Deep Singh was the first head of Misl Shaheedan Tarna Dal – an order of the Khalsa military established by Nawab Kapur Singh, the then head of Sharomani Panth Akali Buddha Dal. The Damdami Taksal also state he was their first head of their order. His name is also found as Deep Singh (without the “Baba” honorific) and Baba Deep Singh Ji. Shaheed Baba Deep Singh Ji was born on January 20, 1682, in the village of Pahuwind, district Amritsar. His father’s name was Bhai Bhagtu Ji. At the age of 12, Baba Deep Singh Ji went with his parents to Anandpur Sahib to meet Guru Gobind Singh Ji, the tenth Sikh guru. They stayed at Sri Anandpur Sahib for several days, doing sevaa (service) with the Sangat. When his parents were ready to return to their village, Guru Gobind Singh Ji asked Baba Deep Singh Ji to stay with him. He humbly accepted Guru Ji’s command and began serving him. Baba Deep Singh Ji stayed in Guru Gobind Singh Ji’s service for about 8 years. At Guru Ji’s request, he returned to his village to help his parents and he got married. Guru Gobind Singh Ji met Baba Deep Singh Ji at Takht Sri Damdama Sahib, Talwandi Sabo in 1705. Here, he learned that two of the Guru’ sons, Baba Ajit Singh Ji and Baba Jujhar Singh Ji, had become Shaheed (martyred) in the battle of Chamkaur Sahib. Guru Ji also told him that his two younger sons, Baba Zorawar Singh Ji and Baba Fateh Singh Ji, were cold-heartedly bricked alive and attained Shaheedi (martyrdom) at Sirhind under the orders of the governor Wazir Khan. In 1706, Guru Gobind Singh Ji placed Baba Deep Singh Ji in charge at Sri Damdama Sahib, while Bhai Mani Singh Ji was made Head Granthi of Sri Harmander Sahib in Amritsar. After Guru Sahib left for Delhi, he took up the duty of preparing copies of Sri Guru Granth Sahib Ji and carried on the sewa blessed by Guru Gobind Singh Ji of managing this Sikh Centre. ‘Taksaal’ means a minting factory. Sri Damdama Sahib, had become a factory where Sikhs would come to mint and prepare their shastars (weapons), as well as mint their minds and enshrine Gurbaani within their hearts through learning the correct pronunciation and grammar of reading Sri Guru Granth Sahib Ji. As a result this centre of education and weaponry was known as ‘Damdami Taksaal’. Baba Deep Singh Ji spent many years at Sri Damdama Sahib preaching Sikh values and teachings and doing sevaa of the Sangat. He was always ready to serve those in need and to fight for justice. In 1709, Baba Ji joined Baba Banda Singh Ji Bahadar in punishing the tyrants of Sadhaura and Sirhind. In 1733 Nawab Kapoor Singh Ji, the commander of the Khalsa forces, appointed Baba Ji as the leader of one of the jathas (groups) of Dal Khalsa (a united and collective body of groups of Khalsa divided and dispersed across Panjab). On Vaisakhi day of 1748, when Dal Khalsa was reorganised into twelve misls, he was entrusted with the leadership of Shaheedaa(n) di Misl. At the news of the approach of Singhs, the Governor of Lahore sent one of his generals with an army of twenty thousand to face them. His army took up position six miles north of Amritsar and waited for the Singhs there. Both the armies clashed near Gohalwarh on the 11th November, 1757. Fighting bravely, the Singhs pushed the army back and reached village Chabba where Attal Khan came forward and fierce battle ensued during which Attal Khan inflicted a blow on Baba Deep Singh Ji severing his head from his body. Baba Deep Singh, more than 75 years of age at that time, started to lose his footing under the impact of the blow, when a Sikh reminded him, “Baba ji, you had resolved (Ardaasa soddhyaa see) to reach the Parkarma of Sri Darbar Sahib.” On hearing this, a divine energy suddenly took over, and Baba ji placed his head on the palm of one hand and with the other hand moved his 14kg Khanda (double-edged sword) with such ferocity and strength that enemy soldiers started running away in panic. Thus, Baba Deep Singh made his way to the Parkarma of Sri Harmandar Sahib where, due to the severe injury, attained martyrdom. The Singhs celebrated the Diwali of 1757 in Sri Harmandar Sahib. The place where his head had fallen is marked by a stone and the Sikhs go past this place on their way to pay obeisance in Sri Darbar Sahib. It reminds them that the way to Sri Darbar Sahib is paved with the sacrifices of people like Shaheed Baba Deep Singh Ji. Dhan Guru, Dhan Guru Ke Piaare. Dhan Shaheed Baba Deep Singh Ji. This blog post was very helpful to me. I’m sure others may find it useful as well.